Lekhapal, Cashier and other posts in state/ District level. Job Seekers having eligible criteria can apply for these Dist Manager Jobs on or before 03/06/2017 by visiting the official website @ http://www.prd.mp.gov.in through online. There are total 151 vacancies available in this MPPRDD recruitment 2017. 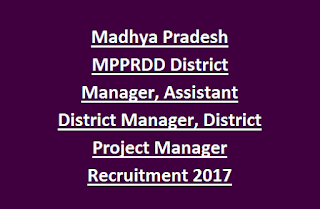 This Dist Manager, Assistant Dist Manager Jobs in Madhya Pradesh MPPRDD Recruitment will be based on written examination/ Interview. See the below given details for State/ District level vacancies, Age limit, Educational qualifications, Application process and other details of Madhya Pradesh Panchayat and Rural Development Department MPPRDD Recruitment examination notification. See the official notice of MPPRDD District Project Manager Jobs Recruitment. Last date to submit online applications: 03-June-2017. State Level Vacancies: 03 posts. Assistant State Project Manager: 01 posts. District Level vacancies: 148 posts. District Project Manager: 19 posts. District Manager (Agri): 23 posts. Assistant District Project Manager (Community Training): 17 posts. District Manager Evaluation and Monitoring: 17 posts. Dist. Manager- Skills Upgradation and Employment: 19 posts. Dist Manager (Micro Finance): 19 posts. Dist Manager (Small Enterprise Development: 18 posts. Assistant Dist Manager (Micro Finance): 16 posts. Pay Scale for for Dist. Project Manager: Rs. 50,000/-. Candidates must have completed Graduation/ Post Graduation degree from any recognized University. Please visit advertisement for post wise qualification details. Candidates applying for Dist Manager Posts should have upper age limit of 55 years as on 31-03-2017. Age relaxations are given for reserved candidates applicable as per Govt Rules. Selection for this MPPRDD Recruitment will be held based on written test and personal Interview. Please see the official notification for examination fee @ http://www.prd.mp.gov.in. Interested/ Eligible candidates have to apply for these Jobs through online using the MPPRDD official website @ http://www.prd.mp.gov.in. Fill the application form through online in prescribed format. Last date to upload filled application through online on or before 03/06/2017. 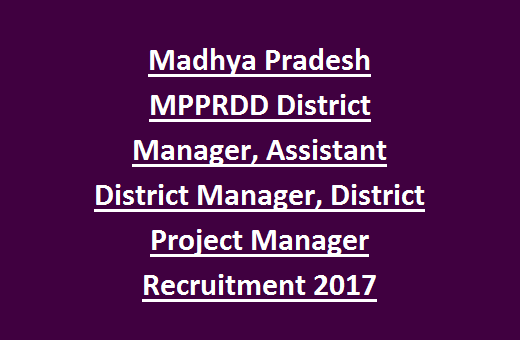 Apply online for MPPRDD District Manager Jobs Recruitment 2017. Please share this MPPRDD Recruitment Examination 2017 article to your friends via social web sites. available in Madhya Pradesh State. Only concerned districts local candidates are eligible for this recruitment of National Institute for Entrepreneurship and Small Business Development, Avadi Madhya Pradesh. Selection for this Apprentices Recruitment of Madhya Pradesh NIESBUD will be held based on merit in personal interview. For more information regarding Madhya Pradesh NIESBUD District Manager recruitment 2016 please see the given details below. This recruitment is purely contract basis of one year only. Based on review yearly renewal will be given up to 3 years. There are total 102 vacancies available in Madhya Pradesh NIESBUD Recruitment 2016. 2 Posts for each district. Selection process for this MP District Manger recruitment of NIESBUD CSC E Governance Ltd will be held based on Personal Interview only. Eligible candidates can send the application/resume along with self attested copies all required documents like educational qualifications, date of birth certificate, Community certificate and experience certificates if any related documents through email to cscupmp@gmail.com on or before 02-06-2016. In Subject Mention "Recruitment for CSC, District----------------------------- "
Please share this information with your beloved friends through social media. Click here to see the official notification..